Hi, there! Welcome to Easy Code Way. I am Vivek Chaudhary, founder of this blog. I am a professional blogger, tech geek and young entrepreneur from India. 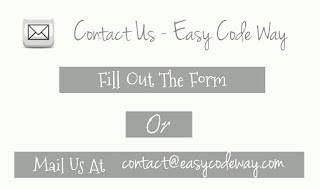 If you have any queries related to advertising, sponsorship or any kind of feedback, feel free to drop your mail at contact@easycodeway.com. Please make sure to add proper subject line. You can also fill out the form below to contact me. I will get back to you as soon as possible.